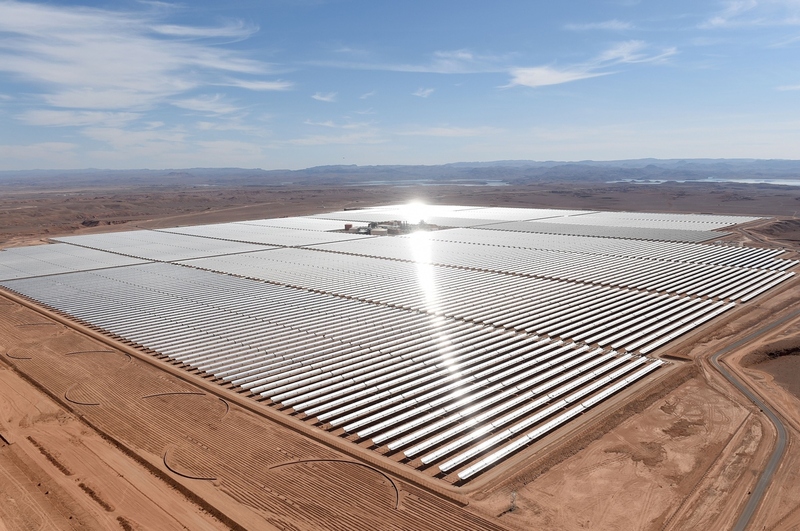 Morocco Unveils A Massive Solar Power Plant In The Sahara : The Two-Way The Noor I solar thermal power plant is the first phase of a project that's projected to provide more than a million Moroccans with electricity — even once the sun has gone down. 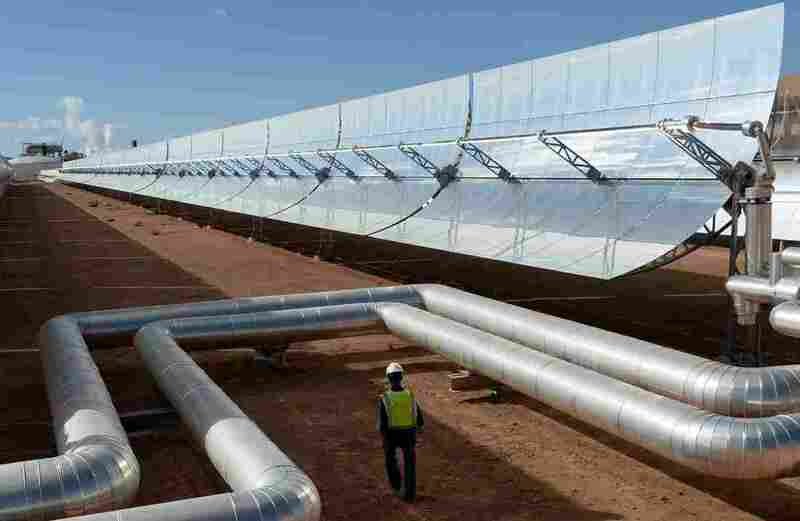 The Noor I Concentrated Solar Power plant, shown on Thursday, is the first phase of a large solar thermal power plant that is intended to supply more than a million Moroccans with electricity. The Noor I power plant is located near the town of Ouarzazate, on the edge of the Sahara. It's capable of generating up to 160 megawatts of power and covers thousands of acres of desert, making the first stage alone one of the world's biggest solar thermal power plants. When the next two phases, Noor II and Noor III, are finished, the plant will be the single largest solar power production facility in the world, The Guardian says. Morocco currently relies on imported sources for 97 percent of its energy consumption, according to the World Bank, which helped fund the Noor power plant project. Investing in renewable energy will make Morocco less reliant on those imports as well as reduce the nation's long-term carbon emissions by millions of tons. A worker walks past solar mirrors at the Noor I plant in October, while engineers were preparing for the plant's official launch. 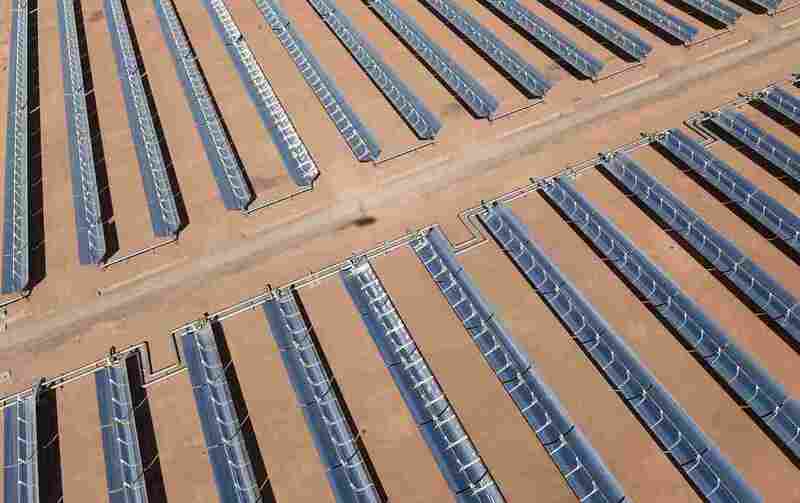 "The system at Ouarzazate uses 12-meter-tall [39-foot-tall] parabolic mirrors to focus energy onto a fluid-filled pipeline," NASA's Kathryn Hansen wrote. "The pipeline's hot fluid — 393 degrees Celsius (739 degrees Fahrenheit) — is the heat source used to warm the water and make steam. The plant doesn't stop delivering energy at nighttime or when clouds obscure the sun; heat from the fluid can be stored in a tank of molten salts." The ability to store the heat to make energy when the sun is not immediately shining is a major advantage of solar thermal power (also called concentrated solar power or concentrating solar power). Unlike photovoltaic systems, thermal systems don't suddenly drop in output when a cloud passes over the sun, and you don't need batteries to store some energy for nighttime use. In Morocco, as the BBC notes, the first stage of the power plant will generate electricity for three hours after nightfall, and the full complex is meant to produce power 20 hours a day. 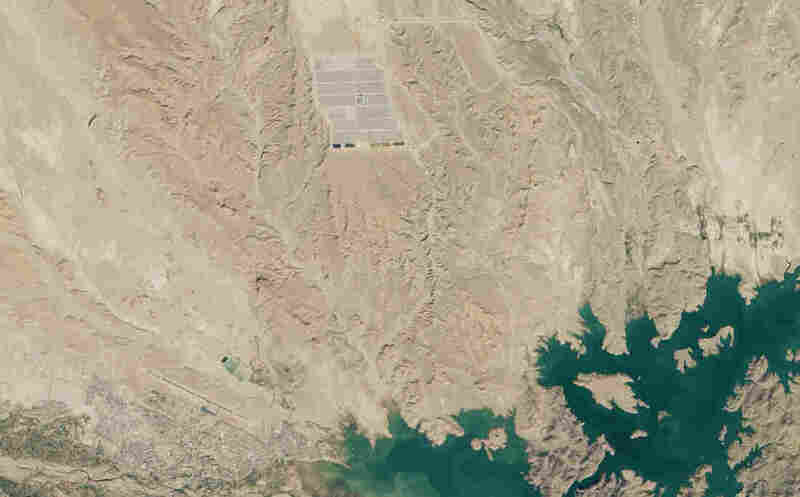 "The potential for solar power from the desert has been known for decades. In the days after the Chernobyl nuclear accident in 1986 the German particle physicist Gerhard Knies, calculated that the world's deserts receive enough energy in a few hours to provide for humanity's power needs for a whole year. The challenge though, has been capturing that energy and transporting it to the population centres where it is required. "As engineers put the finishing touches to Noor 1, its 500,000 crescent-shaped solar mirrors glitter across the desert skyline. The 800 rows follow the sun as it tracks across the heavens, whirring quietly every few minutes as their shadows slip further east." They'll soon be joined by hundreds of thousands more mirrors: As Morocco's King Mohammed VI commissioned Noor I, he also officially launched the construction of Noor II and Noor III.